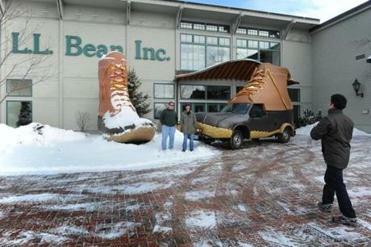 The giant “L.L.Bean Bootmobile’’ made its way south on US Route 1 in Freeport, Maine, on its way to the L.L.Bean flagship store. L.L.Bean is booting up its 100th anniversary celebration with a special outdoor collection, a partnership with the National Park Foundation, and the debut of the “L.L.Bean Bootmobile,’’ a 13-foot-high, 20-foot-long vehicle shaped like - what else? - a boot. The preppy Maine retailer was founded a century ago by Leon Leonwood (L.L.) Bean after he returned from a hunting trip with cold, wet feet. He launched the company with a single item, the Maine Hunting Shoe, and it remains one of the merchant’s staples. To commemorate 100 years of outfitting America, L.L.Bean is introducing a special-edition boot that closely replicates the first pair introduced by Leon Leonwood, complete with its easily recognizable red brick-colored bottom. For those really caught up in the Freeport company’s birthday party, other limited-edition offers include a $7,500 wooden canoe, $149 Soule Coastal Duck Call, and a 20-gauge shotgun for $15,000. “The collection pays homage to our heritage as an outdoor company and brings these products, which have been sold through the course of 100 years, back to life,’’ said Mike Gawtry, L.L.Bean’s director of sporting equipment. The products are likely to get some serious attention from consumers in Lexington, which was designated “The Beanest Town in America’’ in a new book released by the company called “Guaranteed to Last.’’ Annual household spending on Bean products in the town (population 30,382) averages $60, according to the book. 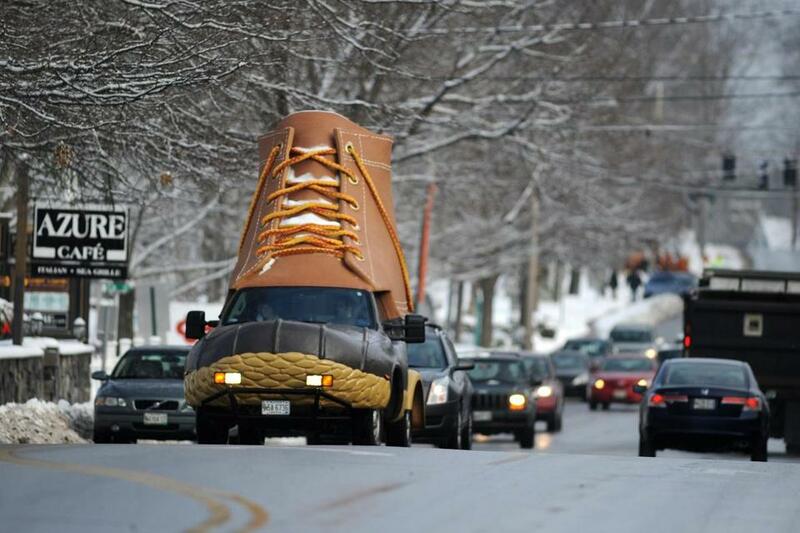 Because of the devotion of Lexington residents, the Bootmobile is likely to visit there during a planned spring tour. After the boot on wheels was unveiled yesterday at the Brunswick, Maine, factory where Bean boots are made, it stopped at the L.L.Bean flagship store in Freeport and then headed to New York City, where it is expected to appear today in Times Square. The Bootmobile is true to the original Bean Boot design, except it sports the tan rubber sole found in contemporary versions. Its laces are made of 12-strand braided mooring rope, capable of towing 106,000 pounds, and the driver enters and exits through the heel. As part of the anniversary promotions, Bean today is expected to detail a yearlong partnership with the National Park Foundation called “The Million Moment Mission.’’ The company says the idea is get people to use social media to share outdoors experiences through online comments, photographs, stories, and video. Bean said it will donate up to $1 million to the effort. The outdoors theme will also carry through to the Bootmobile tour. During its travels, the vehicle will be accompanied by L.L.Bean’s Outdoor Discovery School guides, who will encourage people to get out of their homes and get back to nature.